Maxthon browser for Android - How universal is it really? I’ve tried out a fair amount of browsers for Android, but after a mere few days I toss them out and go back to my trusty old standard browser which has served me so well on my Nexus One. In this review you’ll find out whether the Maxthon browser for Android has secured a place on my phone and in my heart. 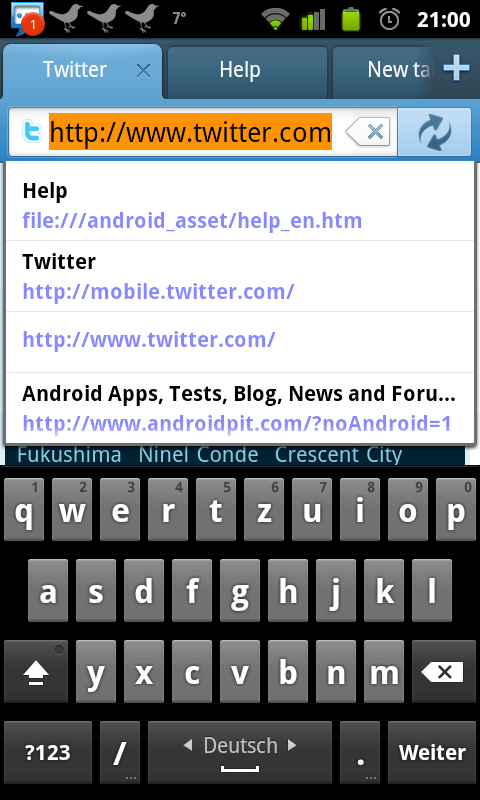 Synchronisation works flawlessly—but it’s limited to bookmarks. Firefox is a step ahead as it also synchs your browsing history… such a function would be a welcome addition to the Maxthon browser. The RSS-Reader didn’t perform quite as well, unfortunately. The browser didn’t cope well with XML-Feeds and didn’t display feeds for Endgadget or iBash. The AndroidPIT RSS feed was displayed without fault, however. Feeds can be added easily, which is good. Maxthon automatically searches websites for feeds; an indicator in the URL bar alerts you whenever feeds are found. A simple tap suffices and you’re subscribed—nice and easy, just the way we like it. Speed Dialer displays your favourite websites (which you set yourself) in an orderly fashion. A 3x3 raster displays a preview of the websites using small images. Use the button on the bottom left to access the Speed Dialer when you open up a new tab. If you’ve tried out a few Android Browsers and have used download managers before you will pretty much have gotten the gist of it by now. Maxthon’s download manager is just like any other, so I won’t elaborate. I had to dig deep to find the Gestures. 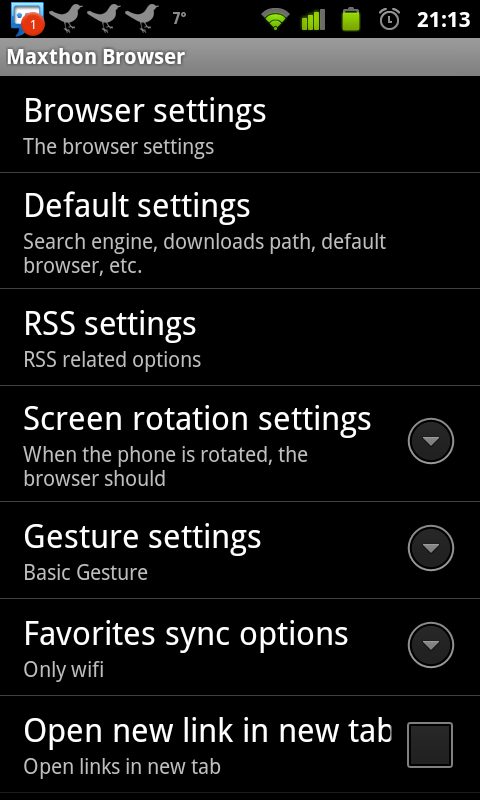 You’ll find instructions regarding gestures under Menu/More/Help. I was annoyed to see that gestures are activated per default, and every time you touch your screen it leaves a yellow trace. “Super Gestures” are, in fact, rather limited: there are less than 5 of them. You can jump to the previous tab, the next one, open up a new tab, close the one you’re currently looking at or recover an old one. There’s room for improvement here, for instance, a “back” gesture wouldn’t go amiss. I can’t say that I was deeply impressed by the Personalisation function, either. Aside from regular browser settings you can adjust your display’s alignment, switch gestures on/off, decide in which networks can by synchronised for favourites and which user agent can be utilised. I was also disappointed to see that the browser doesn’t come with a pinch-to-zoom function. What’s more is that you have to activate the zoom button manually in order to zoom at all, and there’s only one zoom level over the double tap available. The only things that are really notable about this browser is the tabbed browsing function and the RSS reader—provided that a feed is playing along! Don’t get me wrong: this browser has a lot of potential, but for the moment you’re probably still better off with other alternatives such as Miren Browser, Firefox or the good old standard Android browser. Maxthon browser for Android’s design is nice and it certainly doesn’t come across as quite as white-bread-ish as some of the other browsers out there. That being said, it could do with a bit of a clean-up as well as more instructions to ensure more user comfort, as for the moment controls aren’t as intuitive as they could be. 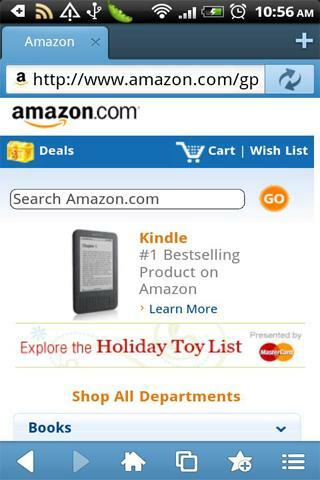 The loading time for websites is pretty decent, but I’m not too keen on Maxthon browser for Android’s UI. 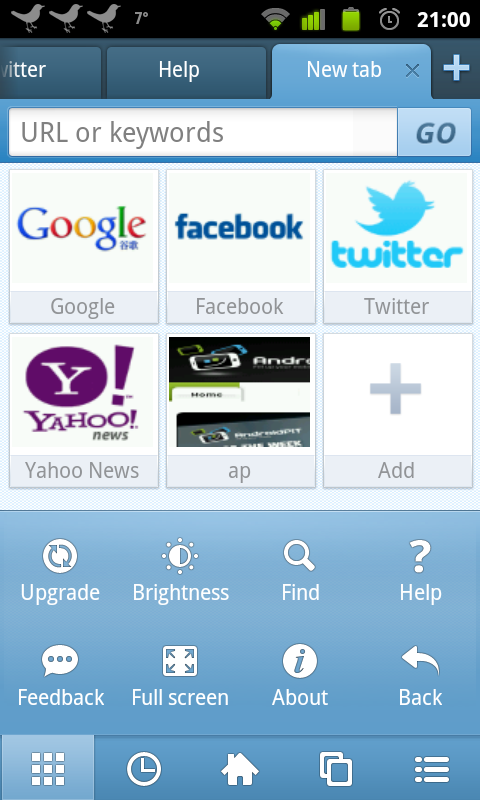 You can download Maxthon browser for Android for free from our App Center as well as the Android Market. Dolphin is still my favorite because of tabs and lastpass integration!